Raumfahrt+Astronomie-Blog von CENAP - Blog: Raumfahrt - Self-taught rocket scientist plans launch to test flat Earth theory/A flat-earther finally tried to fly away. His rocket didn’t even ignite. Science is littered with tales of visionaries who paid for pioneering research to prove their theories, and this weekend “Mad” Mike Hughes is hoping to join them. He plans to launch a homemade rocket in California as part of a bid to eventually prove that the Earth is flat. Hughes has spent $20,000 (£15,000) building the steam-powered rocket in his spare time, and will be livestreaming the launch over the internet. The self-described daredevil says he switched his focus to rockets after twice breaking his back doing stunt jumps in cars. 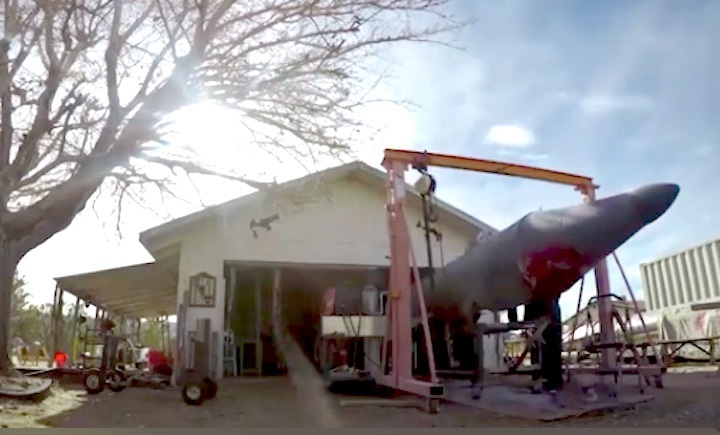 The rocket, which Hughes aims to reach an altitude of 1,800ft (550 metres) over California, will be launched from the back of a converted motorhome purchased from Craigslist. It is sponsored by a flat Earth research group, and Hughes plans a subsequent trip to try and observe the flatness of the Earth for himself. Hughes’ website describes him as “the only man to design, build and launch himself in a rocket” – he previously flew in his own rocket in 2014, as this footage shows. Footage of Mike Hughes’ previous rocket flight. Hughes has stated that once he lands at the weekend, he intends to announce that he is running for the governorship of California. Flat Earth theory has seen a resurgence in recent years, fuelled by online message boards and some high-profile endorsements from celebrities. The Flat Earth Society, founded in 1956 and relaunched online in the 2000s, currently boasts of having over 500 members, although the group has splintered into two separate factions with competing websites. In the NBA, Boston Celtics’ Kyrie Irving made headlines for appearing to endorse the idea that the Earth is flat, and former basketball star Shaquille O’Neal surprised everyone in March by declaring the same. “I drive from Florida to California all the time, and it’s flat to me,” he said in a March podcast, before later retracting the claim saying he’d been joking. Irving has also recently distanced himself from the belief. But Hughes is not alone in his quest to reach the sky to test established science. Rapper BoB has made social media posts supporting the theory in the past, and is currently attempting to raise $1m to place “multiple weather balloons and satellites into space, for experimental exploration”. He has so far only managed to gather nearly $7,000 for the project. It appears we will need to wait a while longer to find out whether more than two millennia of thinkers and explorers — from Aristotle and Ferdinand Magellan, to Neil deGrasse Tyson and John Glenn — have been wrong about the shape of the Earth. 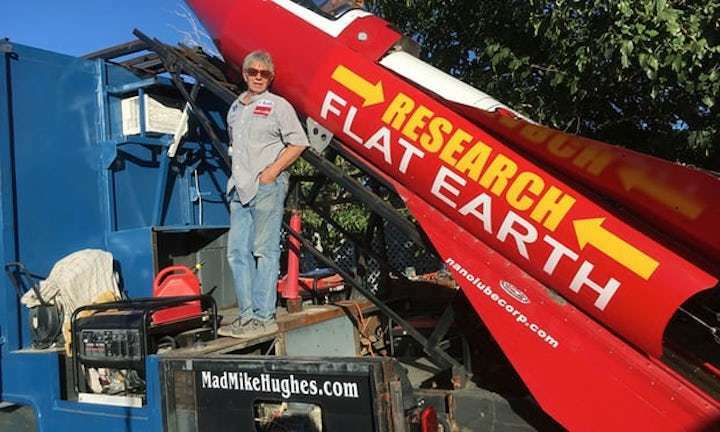 "Mad" Mike Hughes, limousine driver and self-proclaimed flat-Earther, announced that he had to delay his plan to launch himself 1,800 feet high in a rocket of his own making. The launch, which he has billed as a crucial first step toward ultimately photographing our disc-world from space, had been scheduled for Saturday — before the Bureau of Land Management got wind of the plan and barred him from using public land in Amboy, Calif.
Also, the rocket launcher he had built out of a used motor home "broke down in the driveway" on Wednesday, according to Hughes. He said in a YouTube announcementthat they'd eventually gotten the launcher fixed — but the small matter of federal permission proved a more serious stumbling block (for now). The BLM "informed me that they were not going to allow me to do the event there — at least at that location," Hughes said. Hughes asserted that the BLM last year had tacitly left the matter of permissions to the Federal Aviation Administration, and "of course, they can't honestly approve it," he added. The FAA "just said, 'Well, we know that you're going to do it there.' "
It turns out the BLM wasn't satisfied with that explanation — particularly after The Associated Press first reported on the launch for a national audience. "Someone from our local office reached out to him after seeing some of these news articles [about the launch], because that was news to them," a spokeswoman for the agency told The Washington Post, adding that Hughes had not applied to the local BLM field office for the necessary permit. "So, it turned out to be not a good thing," Hughes said. Still, Hughes has not relented in his quest to launch himself roughly 500 mph on a mile-long flight across the sky above the Mojave Desert. He said he has found private property near his original launch site, where he anticipates finally taking off as early as this coming week. For Hughes, this launch would not be his first in a homemade rocket. In 2014, the 61-year-old sent himself flying a quarter-mile across the Arizona desert before pulling out several parachutes of questionable quality on his fall to Earth. He was "in a walker for a couple weeks" after that launch, he told a flat-Earth community Web show. He also hopes it will not be his last such attempt. Since converting to the flat-Earth belief after "research[ing] it for several months in between doing everything else," Hughes has seen a marked uptick in fundraising contributions to his rocket projects. And he has big plans, hoping eventually to launch himself into space, where he believes he can overturn a scientific understanding that predates NASA by at least 2,300 years. "I don't believe in science," Hughes told the AP earlier this month. "I know about aerodynamics and fluid dynamics and how things move through the air, about the certain size of rocket nozzles, and thrust. But that's not science, that's just a formula. There's no difference between science and science fiction." For now, his mission will have to wait. "It's been very disappointing and, I guess, enlightening — this whole week. It really has been," he said. "But it's not easy because it's not supposed to be." Mike Hughes planned to launch his homemade rocket on Feb. 3, after he canceled a launch in November. The second version failed, too. If you were already caught up on the saga, feel free to skip directly to our coverage of Saturday's sad launch. If you need a recap, here are parts 1, 2, 3and 4 of The Post's coverage of Hughes's flat-Earth space mission. To pile on problems, his rocket/rocket launcher/mobile home broke downthe same week.